For such a simple word, it can stir up so many memories and emotions. Like many of you, I imagine, the word “chocolate” takes me back to being a kid. My grandfather always kept a box of Pot of Gold chocolates on a table next to his chair. They were the first thing I looked for every time I visited. That’s the best thing about a grandparents’ house – it’s a safe zone from parental rules. My grandmother was a professional at breaking food rules. She honestly could have written a book about it. It felt like a grocery store. Donuts? Yup, and homemade too. Cookies? Just came out of the oven. Ice cream? Always a tub of Heavenly Hash in the freezer ready to attack. It was food heaven and only a five minute walk from my house. And then there was the box of Pot of Gold. My grandfather has his chair. An old recliner looking out over the family farm. Next to it was his table. Among the many things on the table, it was regularly cluttered with books, a portable cassette player, a candy dish and his collection of tobacco pipes – and a black box of Pot of Gold. Being Nova Scotians, we never had short conversations. So whenever the conversations between adults reached peak boredom for a kid, my grandfather would break out chocolates. I just knew when it was going to happen. He would move with a particular purpose at that moment. Once he had the box in hand, he’s assign either me or my brother the task of taking it around and offering one to everyone in the room. Then we could take our little piece of chocolate and escape to our own world far away from whatever the adults were talking about. My grandfather knew there was a perfect time and place for chocolate. He’d read the room, assess our boredom, and always hit his mark. Not long ago, I realized Jenn and I were at that perfect point for chocolate. I didn’t have any Pot of Gold in the house, but I did have ingredients from something very special. So early on a Saturday morning, I got to work on one of the easiest things I’ve ever made in a kitchen. This is guaranteed to end well. Craft beer used: French Press Vanilla Stout from Double Trouble Brewing Co. Your turn: Seriously, you need to make these! You can find the recipe on the DRAFT website. 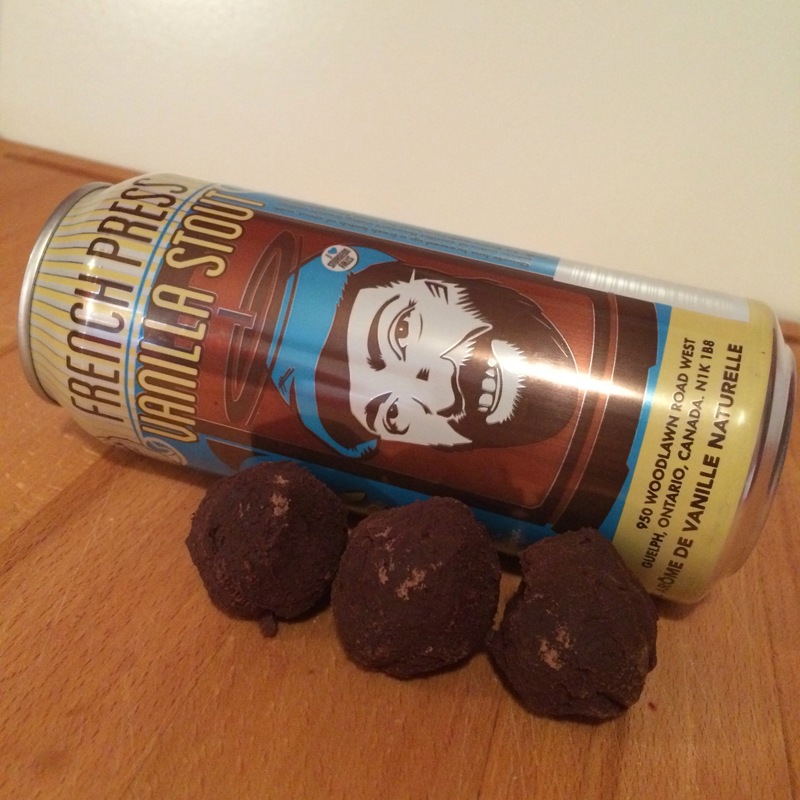 The French Press Vanilla Stout really made these truffles unique. The amazing coffee and vanilla flavours, which make this one of my favourite stouts, added so much complexity to the chocolate. They melt the second you bite into them and the flavour is intensely good. My grandfather was right – there’s a perfect time for chocolate. I highly suggest you make up a batch of these stout truffles so you’re ready when that moment comes along!